Dental implants can help fill the gaps in your smile, without the loss of your existing teeth. A Dental implant is an artificial replacement tooth root, composed with a metal-screw-like structure that takes the place of teeth that are missing. It is an effective treatment that helps preserve your existing teeth. Today, Dental implants are considered a standard of care in dentistry that must be offered by the dentist as one option of dental procedures considered. The Dental implants used at Gentle Family & Implant Dentistry are all made of pure titanium. Titanium is ideal due to it being very compatible with the tissues of the human body. • First and most importantly, the right amount of jawbone, both in width and height must be satisfactory for implant placement. • Secondly, the patient must be in relatively good medical health. Gentle Family & Implant Dentistry conducts a medical consult with your physician if there are any issues that need to be addressed. This includes but is not limited to uncontrolled diabetes, high blood pressure, smoking, and osteoporosis. After a Dental implant is placed by screwing it into the tooth site, it is left alone for a period of 6-8 months so that the bone around the implants can grow right up to the dental implant and “grab” the implant so that a crown or bridge may be placed on it. This process by which the bone cells grab the titanium surface of the implant is called “osseointegration”. If the implant is in a location in the mouth where the space might be visible, a temporary tooth or teeth can be fabricated so that it does not rest on the gum at all. Usually, we ask that patients with implants waiting for the bone to grow to avoid chewing hard foods with the temporary and to keep it extremely clean. 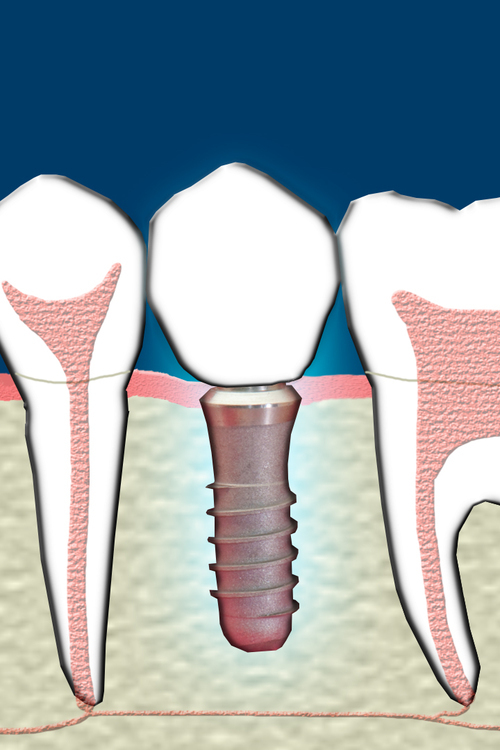 The aspect that sometimes confuses patients is that treatment for the implant involves two phases. The placement of the implant is one procedure (1st phase) and to fabricate the bridge or crown for the implant is a separate procedure (2nd phase) with a second charge. An approximate charge for the placement of the dental implant with the crown is about the cost of a porcelain bridge. This approximate fee may change if a bone graft is needed to make the implant site wider or higher for a better result. Gentle Family & Implant Dentistry plans for the implants, places the implants, and restores the implants all in the same office. One should consider that it will take about 12 months to place and restore the dental implants. This time could be longer if a bone graft to build up the bone is also done. Scrupulous dental hygiene is a commitment the implant patient must make before placement. The implant patient will be seen every six months for cleanings of the mouth and certified hygienists who are familiar with cleaning dental implants treat the implant patient. Contact Us to schedule your Dental Implant appointment today at 956 726 9418.